So for years, I have been making this awesome, super healthy and now SUPER trendy broth called Bone Broth. 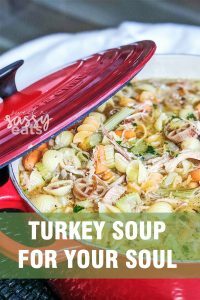 I didn’t realize how amazing this stuff was and was always confused on why my homemade broth would gel up when cooled… but HEY it tasted GREAT so who cares?! 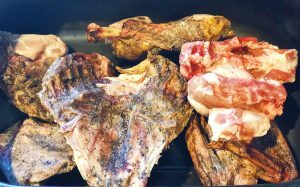 Turns out that the Bone Broth I made every year after Thanksgiving Day was incredibly healthy for you in so many ways and that I could do the same thing with other animal bones for different flavors and applications. It also makes me feel SUPER cool to be able to use literally EVERY PART of that Turkey or other animals in every way. So What Can This Powerful Brew Actually Do? Have you heard of “Leaky Gut”? So many of us (due to stress and environmental factors) deal with some form of the leaky gut syndrome. 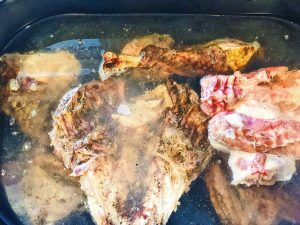 Bone broth has Glutamine and Glycine in it that are both important nutrients that help heal the small holes in your gut lining and normalize the acid production in your stomach. The Glycine also helps in detoxing your liver! For your joints, cartilage, bones, teeth, hair skin and nails, the Glycine and the Proline (that are released from the gelatin found in bone broth) are the two materials your body needs to rebuild tendons, ligaments and other connective tissue like skin. These all help your body create collagen to help repair and rebuild your body! 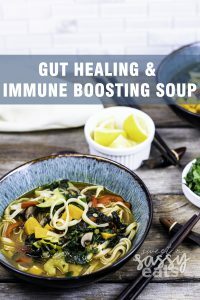 Basically, this is a heal all broth that you should really make a part of your daily consumption… you can either drink it straight OR make it into yummy soups (my favorite way to enjoy it). The size, in the electric roaster I can make a TON of broth at once and it can hold my whole turkey carcass. I can have it run for the 24-48 hrs with less stress than having an open flame on my stove running that long. 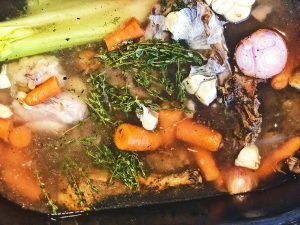 Flavor… the instant pot can make both broths very quickly (4hrs vs. 48hrs) BUT the flavor you get from slow and low roasting it I think is WAY better, plus I think it pulls more nutrients out. I like to use COLD bones. Usually, I freeze my animal bones until I have enough to make a large batch. For my Turkey, I break all the pieces down and put into freezer bags and freeze until I am ready to make it. (Typically I need a break from cooking after Thanksgiving and do not want to make anything for a couple days). Put cold bones in electric roaster pan; add enough COLD water to barely cover the bones (typically around 2 gallons). Add 2 TB of Apple Cider Vinegar, and allow it to sit for 30min before turning on the heat. (This helps the vinegar begin to break things down and pull more good stuff out). Add veggies ends (as in onion ends, celery ends, carrot ends, garlic cloves etc) & herbs. Once at a boil, drop the temp to keep it at JUST ABOUT TO BOIL. (Typically around 175-200 degrees for me). Keep covered. Let it simmer for 24-48 hrs until everything is really broken down well. If water is getting low… add more. YOU DO NOT WANT IT TO DRY OUT, you need the broth! Strain out everything with a colander and cheesecloth. Pour into a container to cool, once fully cold, it should “gel” up and that means you did it right! To Store, you can freeze (I’d recommend freezing in 8oz portions for ease of use). How to save money on Travel! Posts may contain affiliate links, which means that I make a small commission off items you purchase at no additional cost to you.